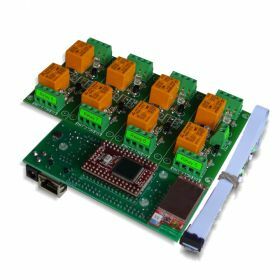 This is WiFi Wireless 8 channel SPDT relay module (board) for remote management and control with Virtual Serial Port, TCP/IP, Web, HTTP API, Telnet and serial commands access. It has 8 SPDT Relays, 8 digital inputs, 8 analog inputs and one UART port. Inputs can be adjusted to control relays (standalone work). Also inputs of one controller can control outputs of another over the LAN/WAN (box-to-box mode). It can send E-mails on inputs change as well. Suitable for remote control, home automation, data acquisition, sensor processing, alarm systems, PLC applications. Works with Domoticz and OpenHAB home automation systems as well as with Node-RED IoT platform. Now with FREE Android and iOS App! smartDEN IP-Maxi is an Ethernet module (IP controller) that can be used in a wide range of remote sensors monitoring, home automation control, environmental monitoring and data-acquisition applications. 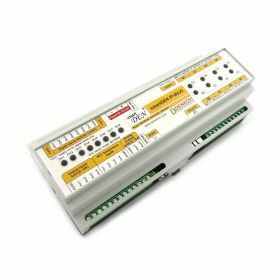 Thank to its multi-channel design (8 digital inputs, 4 analog inputs, 4 temperature inputs, 8 SPDT relays and 2 analog outputs) this device can perform simultaneously a variety of measurement and control functions. The Web interface allows users to configure the smartDEN IP-Maxi, as well as to monitor/control input/output channels. smartDEN IP-Maxi provides both SNMP and XML/JSON interface for integration with third-party developed applications. Works with Domoticz and OpenHAB home automation systems as well as with Node-RED IoT platform.